Beautiful card! I like the ribbon behind the image and the little roses. Thanks for playing with us at Birthday Sundaes! Too cute! I love that image. Thanks for joining us at Aud Sentiments. Great card - very girly and I love that image so cute. Thanks for joining us over at Kaboodle Doodles and good luck. This is adorable! Great embellies also. This is so cute! I love the embellishments you used. Check out my blog candy! 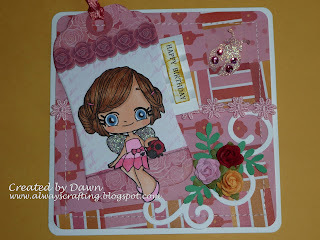 This is one fabulous card Dawn love all the wonderful detail, colours and image, thank you for joining us at Aud Sentiments. Thanks for being ODD with us! Beautiful card - lovely stamp! Many thanks for taking part in the Mami Doodles challenge. Great card! I love how the image is sitting on the tag. Thanks for playing along with Birthday Sundaes! Totally adorable! Great Some Odd Girl image! This is adorable! Great take on our pleating challenge! Thanks for joining us on Some Odd Girl! Really pretty Dawn and envious of your warm weather, freezing here in the UK. I adore SOG stamps as well. You've done a great job with this one!! Love all the details on this card! Thanks for joining us at Birthday Sundaes this week! Adorable card, Dawn! Thanks for playing along with the Kaboodle Doodles Challenge! A fun card with a great tag. (on a side note - your site is making me crave jelly bellies!) Thanks for playing along at Mami Doodle. Adorable card! Great mix of papers! Thanks for playing with Birthday Sundaes! LOVE those huge eyes on your image. Thanks for playing at Fairy Fun Fridays this week! This is gorgeous! Thanks for joining us for the CES Challenge.